Leipzig v Dortmund kicked off with a major shock for the visiting side. Borussia Dortmund had to cope without Marco Reus and start Julian Weigl once again in the back four. Leipzig, however, could not capitalise as Dortmund collected three big points in the title race. As expected it was a high energy game from the go with the first chance falling to Dortmund. In the 7′ minute, Raphaël Guerreiro tanked is way into the box and laid the ball off to Axel Witsel whose shot was stopped by Peter Gulacsi. Just two minutes later Kevin Kampl tested Roman Bürki with a shot on the other side. The opening minutes were best defined by the pace that both sides put on the pitch. High press and aggressive attacking football were the names of the game in the opening minutes, but at the 15-minute mark, Dortmund began to settle the game somewhat by controlling the ball. In the 19′ minute, Dortmund took the deserved lead. A corner was poorly cleared by Leipzig, and the ball fell to Axel Witsel inside the box, and the Belgian hammered the ball onto the underside of the bar from where the ball hit the back of the net. Experience the Bundesliga live! Book your European football travel now by visiting Nickes.com! With the goal in their back, Dortmund started to take the foot off the pedal a bit. That in turn, allowed Leipzig to press further up the pitch and in the 38′ minute Yussuf Poulsen had the big chance to equalise but was a step too late after Konrad Laimer played a dangerous ball in the box. Meanwhile, Abdou Diallo almost doubled the lead on the other side when he got on the end of a Jadon Sancho freekick, but his header missed the target. Leipzig should have produced the equaliser within two minutes of the restart. Marcel Sabitzer received the ball deep in Dortmund’s penalty box and already had Bürki beat but instead of hammering the ball home tried to lop the ball to the centre of the box allowing Bürki to recover and collect the ball. On the other end, Maximilian Philipp should have doubled the lead in the 54′ minute. The striker beat the offside trap and went one-v-one with keeper Gulacsi, who got just enough on Philipp’s shot to steer the ball past the far post. Despite missing Marco Reus, and playing with a makeshift back-four, Dortmund were in complete control. 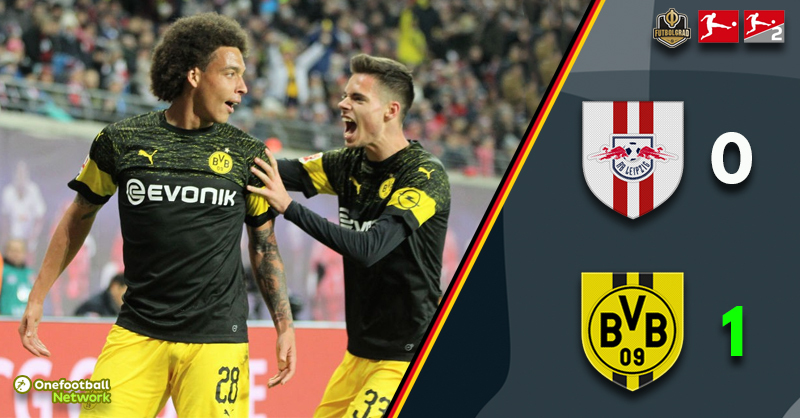 Leipzig were unable to insert any pressure and even when Dortmund did make mistakes like it was the case when Bürki gave the ball away in the 64′ minute, die Roten Bullen could not capitalise. In the 74′ minute Marcel Sabitzer appeared to have scored. At least that is what everyone at the RB Arena though, the Austrian appeared wide open in front of the Swiss keeper but Bürki spread out and stopped the shot. Leipzig were now the more active of the two sides and were pressing for the equaliser. The time, however, was ticking away for die Roten Bullen as Dortmund hung on to the lead. Paco Alcacer almost put the game to bed in the 90′ minute. Diving into a low cross his shot ricocheted off the bottom of the bar, but inches separated the Spaniard from his 13th goal of the season. That miss was almost punished by Leipzig in the dying moments of the game, Matheus Cunha got on the end of a Werner cross, but his free header hit the outside of the net, letting Dortmund off the hook. Although he had one wobble Roman Bürki was the man of the match. The Swiss keeper made five big saves and came up big against Sabitzer to preserve Dortmund’s lead in the second half. Even when he did lose the ball Bürki in the 64′ minute needlessly he did well to recover from the situation and ultimately regained possession. It was a statement game by Borussia Dortmund, who did well to respond to Bayern’s Friday game. They went into this game with a makeshift backline and no Marco Reus. Nonetheless, they managed to walk away with three massive points against a RasenBallsport Leipzig side that asked all the right questions but lacked the final consequence to beat the Black and Yellows. Timo Werner has failed to score in 729 Bundesliga minutes against Borussia Dortmund. Borussia Dortmund won the last 13 games after taking the lead in the first half. Lukasz Piszczek started the game as captain for Borussia Dortmund for the first time – making his 200th appearance in Dortmund’s starting XI in the Bundesliga. Manuel Veth is the owner and Editor in Chief of the Futbolgrad Network. He also works as a freelance journalist and among others contributes to Forbes.com and Pro Soccer USA. He holds a Doctorate of Philosophy in History from King’s College London, and his thesis is titled: “Selling the People’s Game: Football’s transition from Communism to Capitalism in the Soviet Union and its Successor States,” which is available HERE. Originally from Munich, Manuel has lived in Amsterdam, Kyiv, Moscow, Tbilisi, London, and currently is located in Victoria BC, Canada. Follow Manuel on Twitter @ManuelVeth.